Meet Crystal Leonard, CRNP! 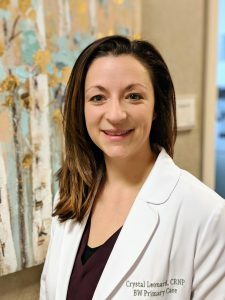 With over 16 years of experience in the medical arena, Crystal is a highly learned and astute clinician who enjoys effectively guiding patients on their disease treatment and prevention path. She is available at our Eldersburg office to see patients, ages 12 and over. Read more about Crystal here. And, call our office at 410-552-5050 to schedule your appointment now.